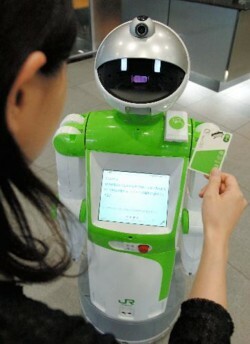 East Japan Railway Company (JR East) has become the world's first railway company to develop a humanoid robot guide. JR East spent two years working with a Japanese robot manufacturer to develop the droid, nicknamed "I" (which stands for "information"), who the company is now grooming for employment at train stations. 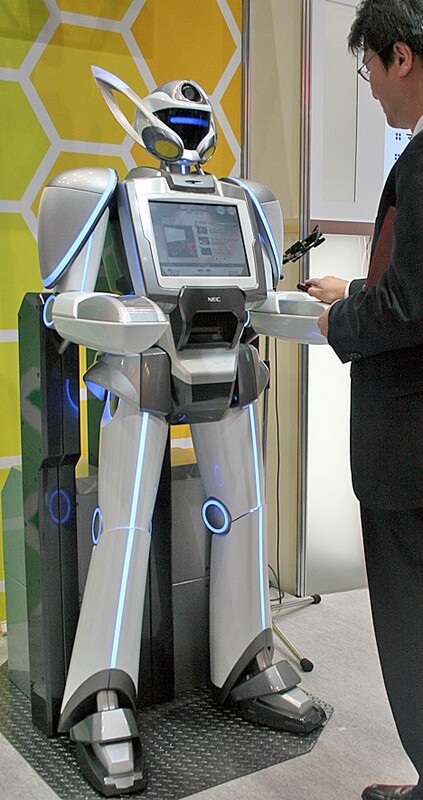 I stands 120 centimeters (4 ft) tall, weighs 50 kilograms (110 lbs) and is equipped with a Suica card (JR's rechargeable contactless train pass) reader on its shoulder and a touch screen on its chest that can display a variety of data. The robot moves around on wheels and is nimble enough to spin around in place. I's future duties include providing assistance at customer service windows, performing security patrols around stations at night, and assisting station workers with other duties as needed. 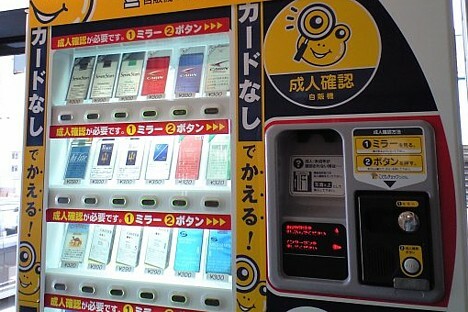 As of now, the robot's reception skills include the ability to read Suica cards held near its shoulder and ring telephones to notify representatives of customers in need. 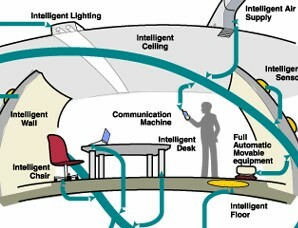 The robot can also show customers to reception areas and it can point the direction to the restrooms if asked. Face and voice recognition skills allow it to carry on simple conversations with the people it encounters. The robot was subjected to about 10 days of testing at JR's research facility in Saitama City at the end of July. However, the droid did not perform very well in the tests, receiving poor marks for awkward and slow movements. Being awkward and slow does not appear to be a major obstacle to I's employment prospects, though. For the time being, it seems that the robot will get by on charm. 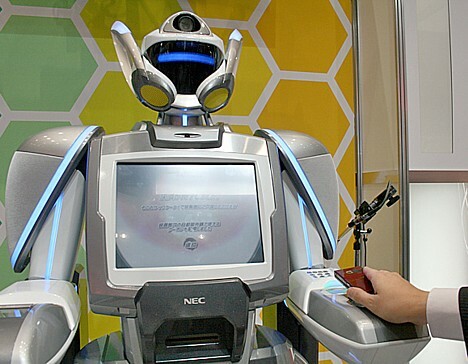 "Customers find the robot entertaining," says JR East research director Takashi Endo. "There are still a number of issues that we need to address, but it can be used to create some amusement in the stations." On January 25, Fujitsu, AEON and Dai Nippon Printing announced plans to conduct a trial run of a retail support system that uses IC tags and data display terminals. In this retail service system of the future, customers will be able access a variety of product information by electronically reading tags placed on supermarket shelves. The trial run will be conducted at Jusco supermarket (Yachiyo-midorigaoka branch) for a five-week period beginning February 6, in Yachiyo City, Chiba. The trial run is part of the Ministry of Economy, Trade and Industry�s 2005 "Japan Future Store Project," featuring a series of trial demonstrations of electronic tag applications aimed at realizing retail services of the future. The store will be outfitted with 25 "shopping navi-carts" equipped with tag readers and data display terminals, and IC tags will be attached to approximately 500 selected food items. 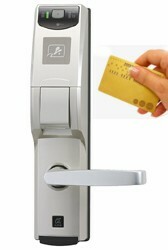 Shoppers will be able to view a variety of information, ranging from product descriptions and instructions to video commercials, by holding the tag reader near the tags. 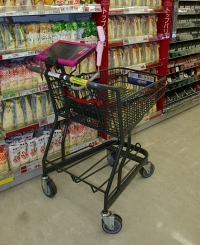 The equipment will also assist shoppers in locating specific products within the store. When carts are moved to specified locations, promotional information and other data related to the relevant product category will be delivered to the data terminals. Customers using the system will be asked to complete surveys after they finish shopping. Technical issues and other side effects, such as whether or not customers purchased more when using the carts, will also be studied. 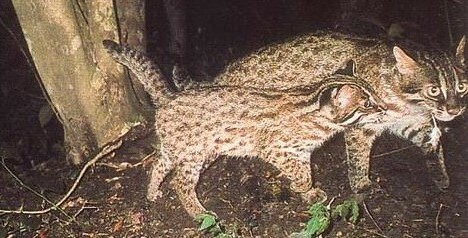 Each company will play a specific role in the trial run. Aeon will run the experiment in the store, review the content, and link the trial system with the existing system. Fujitsu will handle project management, provide administrative support, configure the system, and provide the navi-cart data terminals and software. 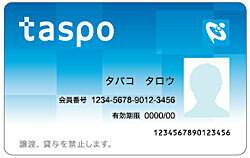 Dai-Nippon Printing will create content and provide programming support.